A Month of Letters. It’s here. And I am definitely participating (speaking of which, I need to write my letter for today). With technology continuing to render things obsolete, many have said that letter writing is slowly dying out as well. I can see why people may believe that. After all, a majority of the population don’t write letters. I mean, why write letters when you can message someone or email someone? Social media has only strengthened that claim when you can easily check in on a family member or friends feed and click like or send a gif to say hi. While letter writing isn’t the popular choice, I believe it is far from being obsolete. I have stumbled across a few websites dedicated to letter writing, connect fellow letter writers across the globe, and it is as strong as ever. Letter writing has a strong community of letter writers and it doesn’t look like it will weaken anytime soon. 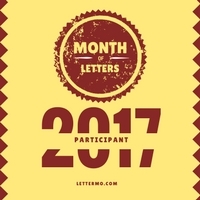 A month of letters is a great challenge that helps bring awareness to this wonderful means of communication. For those of you who wouldn’t mind trying it out, this is the month. As mentioned in other posts, the goal of this challenge is to write a letter a day. The challenge has a website that connects you to others who are participating. I write letters because there is a deeper sense of connection than typing out a few words and clicking send. You have to take the time to write your letter. Actually putting a pen to paper, actually thinking of how to reply, actually thinking about what to write. When I write a letter, I write more than just a paragraph or two. There is a tangible connection between you and your friend receiving the letter. They will open the same envelope you touched. Unfold the papers you folded. Read the words you actually wrote. I love hand writing my letters because it just feels nice, but typing out your letter works just as well. Some people’s hands tire or become sore when they write too long. But you still have a sense of connection. You still have to print out what you typed, prepare an envelope, and the physically send it on its way. When I receive a letter from a friend, I think of its journey, especially if it comes from overseas. I think to myself “this letter has made it all the way from France!” or “from Germany!” or “from Australia!” And those places may seem far, but I get just as excited when I see a letter “from Utah!,” “from Texas!,” or “from Maryland!” Those pieces of paper had to travel a distance to get to me. They had to travel across an ocean to get to me no matter where it originated from. And I am definitely participating.